You’re invited to the “Mask Ball.” Bring your favorite sheet mask, and welcome all ballers on a budget. Want to get your glow up on a time and money budget? For about the price of a bag of groceries, I give myself targeted treatments for specific areas of my face, neck, hands and feet. I can pull the whole thing off in about 20 minutes. So can you. Start with your cleansing routine. I like to wash my face with a natural soap that won’t strip my skin’s healthy probiotic layer. Choose a cleanser full of good fats like coconut olive and palm oils and purifying dead sea mud like Bloom Mineral Beauty Mud Soap ($11.95). Combination oily or acne prone skin can benefit from a soap containing tea tree oil or charcoal ingredients. SheaMoisture African Black Soap ($4.99) is a great alternative. Once your face is clean and moist—not 100 percent dry, because you want a little dew on the skin to help the ingredients in your mask emulsify on the skin—go for the masks of your choice. Plumping out the under-eye area is a big one for me. 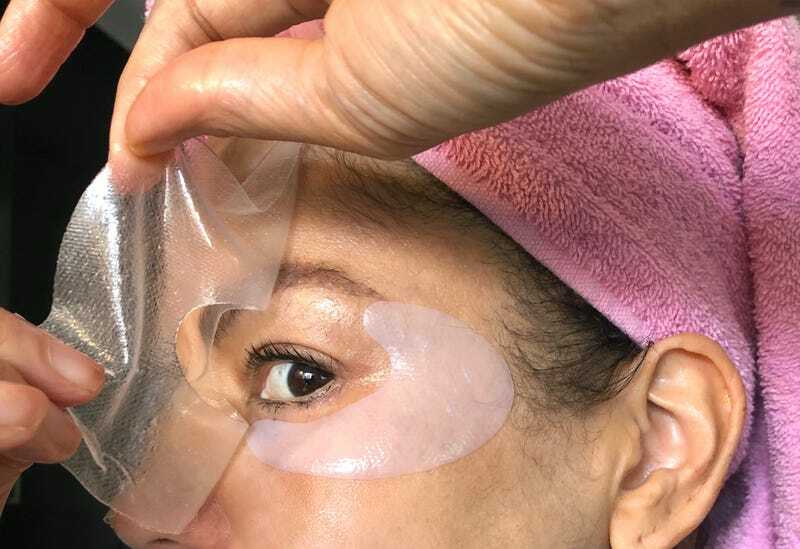 Fine lines, puffiness, dark circles or bags, you name it—there’s an under-eye sheet mask that works for one or all of those pesky factors. Tatcha Luminous Eye Mask ($12) is on my go-to list for two reasons: It’s shaped like a Nike swoosh to address crow’s-feet at the corners of the eyes, and its occlusive layer is formulated to attract and seal moisture into delicate under-eye skin. Apply your eye mask first before layering other masks on top. Pro tip: Refrigerate eye masks beforehand for reducing puffiness and a bonus cooling and relaxation. Natural soaps don’t strip the skin like perfumed soaps or cleansers. Rolling back the years: Eye masks are my go-to beauty savior for tired eyes. Pop them on while you’re sleeping or under a sleep mask for a long-haul flight. Oh sheet! You can get masks targeting any area of the face that could use a little more love—from lifting to brightening to detoxifying. Dr. Jart+ has a literal mask pharmacy at $12 a go. New to masking and not ready to splurge? Try My Beauty Diary‘s 10 masks for $15.99 for a budget multimask tour. Kiss sleeping in socks with your feet slathered in foot cream goodbye! I extend my pedicures and avoid dry, cracked ashy heels caused by friction from flip-flops and sandals while walking. Hydrating the cuticles on your toes, and then gently pushing them back with your finger, makes your polish look nicer longer. This is a little gross—but once you take the booties off, use your thumbnail to remove any dead skin on the tips of your toes. The mask softens dead skin, making it easy to whisk away. Handled: I don’t know about you, but my hands need love, and I’m not necessarily willing to break for love. Get hyper-fast hydration (you can use a touch screen with these babies on), and if you’re looking for hyper-speed mani-pedi polish, check out my article about next-generation press-on nails. Masks come sized to fit and service different areas of the face. For my forehead, where my fine lines become more visible from fatigue or worry, I chose the pioneering wizard of K-Beauty (skin-care products that derive from South Korea), Dr. Jart+’s Wrinkless Solution, $12 mask. Good for all skin types—formulated without alcohol, fragrance or parabens (aka crap you don’t need ’cause it’s only good for profit margins and the shelf life of the product, but not good for you), it’s a crystal-clear sheet of goodness to help melt away worry lines temporarily. Upper and lower masks allow you to mix and match; oftentimes, I’ll use the whole thing, like in the photo above. If not, I’ll seal the unused portion in a ziplock baggie and refrigerate it for another wrinkly day. For masks below the nose, there are a million choices, like this mouthful of a name: Dr. Jart+ Dermask Spot Jet Laugh Line Lift ($12) targets marionette and laugh lines in “the smile zone” with acupressure dots for increasing circulation and plant-based tightening and volumizing extracts. Wet, gooey sheet masks leave a ton of residue on the paper backing that you peel away from the gel mask in the packaging. For leftover serum, it’s a gold mine. Scoop up all that slimy goodness and smooth it onto your neck, elbows and knees. Pop those empty foil wrappers in the fridge and gain a few days’ worth of extra serum. It’s a mask parade from H2T at My Home Spa Night Mask Ball. Handled. That’s all I can say about the Kiss Hand and Nail Mask Gloves and Foot and Toenail Mask Socks ($2.99 each), produced in Korea by K-Beauty experts. Neat and clean—slip on the plastic booties and gloves loaded with argan, collagen, macadamia and shea nut oils with rejuvenating lavender, and buy yourself time between salon mani-pedis. Cleverly, the gloves are touchscreen compatible. No real downtime. You can multitask while you multi-mask, meditate or return emails, whatever flips your switch. Unmasked! These are my glow up results—20 minutes and $40 later. No makeup. No filter. Unmask yourself 20 minutes later; do not rinse the areas you just treated to all those fabulous emollients with water—you’ll wash it all down the drain. All you have to do is say, “Mirror, mirror on the wall, who has the flyest hands, feet and complexion of them all?” You do. No fairy godmother needed, just approximately $40 and 20 minutes for a New York City-salon-comparable glow up.